Yesterday morning, Soledad O’Brien had on her CNN show economist John Lott, of More Guns, Less Crime fame (also an NRO contributor). As I’ve discussed before on NRO, O’Brien has a habit of bringing on conservative guests and then spitting out Democratic talking points under the glib guise of a non-partisan moderator calling them to account on the facts. This might be in large part to the utter ignorance of gun issues O’Brien demonstrates throughout the interview: She suggests, for instance, that mass murders share something in common besides occurring in gun-free zones: “they’re armed often to the hilt with weapons, often with automatic or semiautomatic weapons.” Not exactly, no: Legally owned automatic weapons have been used in two homicides out of tens of thousands that have occurred since 1934. No mass shooting since then has involved an automatic weapon. 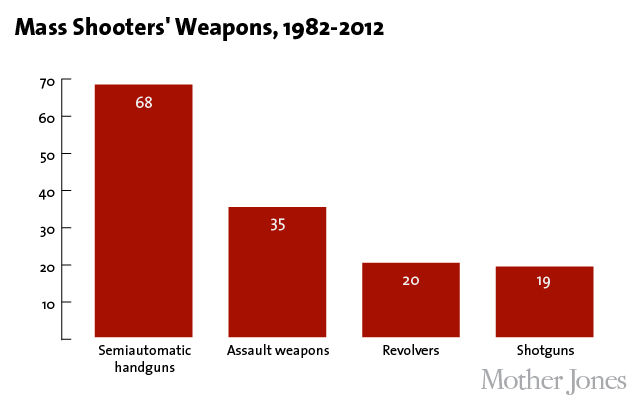 Less than a quarter of the weapons used in U.S. mass shootings since 1982 have involved “assault weapons,” the rifle category the Newtown shooter used. She’s right that the shooters usually use semi-automatic weapons, but it isn’t like these are a close facsimile of full automatics or the weapon used in Friday’s tragedy, as she seems to suggest. O’Brien asserts that “in [the Newtown] case . . . the security was useless. Why? Because he had a high-velocity, multi-shot, many rounds with him, to be able to access the school.” For one, existing law was supposed to prevent him from accessing the school, since it was a gun-free zone, and as if to prove Lott’s point, the “security was useless” because they were unarmed. And somehow his “high velocity” rifle made him particularly effective? The AR-15, while a deadly weapon, has no particularly high muzzle velocity (3,200 ft/s) and is not a very powerful rifle. In fact, as Robert VerBruggen has pointed out, the AR-15 actually uses smaller bullets and is less powerful than single-shot hunting rifles, because it is based off an automatic military rifle that fires smaller rounds in order to reduce recoil. She tells him, quite pointedly, “sir, if you are trying to kill a large number of people in a massacre, that kind of gun is what you grab.” Well, no, it isn’t — only 35 out of 142 weapons used in mass shootings since 1982 in America have been assault weapons. O’Brien’s further ignorance of this topic is revealed when, after dismissing Lott’s citation of Germany, which has essentially banned semi-automatic weapons but has a terrible record of school shootings, she again claims that “a rational person could say that having access to a high-powered, semi-automatic rifle is inappropriate, that there’s no reason to go deer-hunting with that.” The “assault weapon” used in Newtown, however, as in Colorado, was actually not a legal deer rifle because it is actually not “high powered,” it’s too weak to safely kill a deer. #more#If O’Brien were even equipped with the partisan talking points on the issue, she’d have explained that semi-automatic weapons are unnecessary for hunting, but are, as Lott explains, important for self defense. Instead, she just cannot imagine that a “rational person” would believe in access to the high-powered weapons she doesn’t understand. Best of all, though, is Soledad’s last baseless argument pulled out of ether: “If you were to come here and talk to the people of this town, they’d be stunned.” As Lott had pointed out at the beginning of the program, and does at the end, he has actually spoken to plenty of people involved in the shootings about his views, and found that they often sympathized because of how defenseless they’d felt. O’Brien’s liberal views allow her to assume she can simply assert the contrary without argument. A few more of the issues demonstrating O’Brien’s misunderstandings and sentiment-based casuistry: When discussing Lott’s contention that it appears the Aurora, Colo., shooter chose his target because he knew the theater banned guns, O’Brien’s response is as follows: “Let me stop you there . . . another case where someone had a semi-automatic rifle . . . How do you know that [he chose the gun-free-zone theater]? Have you talked to him?” O’Brien here errs twice: She seems to imply that the Aurora shooter was particularly deadly because he had a semi-automatic rifle, when in fact he used a shotgun first (which is pump-action, not semi-automatic), then his semi-automatic M&P15 jammed, and he resorted to a Glock pistol, not a rifle. Further, she only points to the absence of sure evidence (when there is no better explanation) for Lott’s assertion that the Aurora shooter intentionally picked the only gun-free theater in his area, not the nearest, not the largest — to which Lott responds by citing the statistical evidence that mass murderers clearly do pick gun-free zones. Lott then explains some highly disturbing facts (which I’d never heard before) about the Columbine tragedy: One of the shooters actually lobbied Colorado politicians to prevent concealed-carry laws from going into effect, writing letters and more — and the attack occurred on the day a concealed-handgun law went into effect. To this, O’Brien merely expresses more befuddlement that someone has a reaction other than to take guns away from people, which I now might refer to as Columbine-style gun control — that is, precisely what mass killers want. Lott’s thesis is actually contested, for a few reasons — for one, it’s not necessarily clear that in a mass-shooting situation, a civilian would be able to effectively stop it with a gun, though it’s been done (his larger assertions about gun prevalence and crime rates have also been subjected to legitimate questions — it’s very hard to prove such a question one way or the other). But O’Brien, in a telling way, is literally incapable of putting forth these arguments. The media’s ignorance about guns and inability to comprehend that gun control may be ineffective has been on vivid display in recent days; it wasn’t long until O’Brien joined the fray.